Off Limits is what I call this game, and you can call it whatever you like, but the bottom line is that it is an adult party game which is so easy and can be a lot of fun! Use it anytime to keep your guests on their toes! Even better, is that even though this game is listed on the adults page, it is easy for all ages to play, making it perfect for family events and times when you will have a wide range, from young to old. Something to help you keep track of each person's score. It should be easy to handle, easy to trade, and cheap. 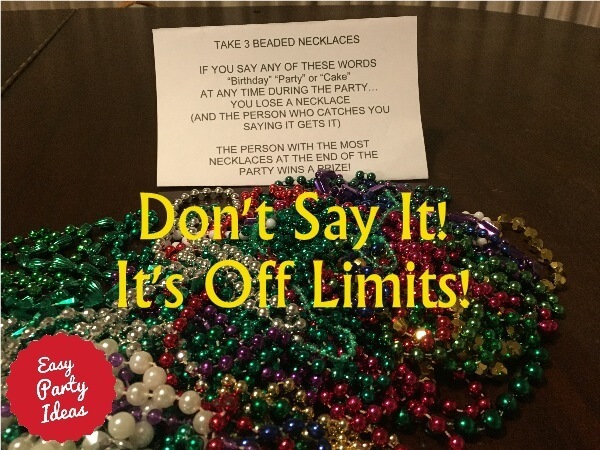 My favorite thing to use is Mardi Gras type beads (have one per guest), they seem to work perfectly, and you can find (Affiliate Link) cheap Mardi Gras Beads at Amazon. To Play: Give each guest one necklace to wear. Tell your guests that one word is forbidden at the party. As party host/hostess, you'll have to figure out ahead of time what the forbidden word will be. The word that can't be spoken should be something that would normally be spoken many times at the event. For example, at a baby shower, you would expect to hear the word "cute" many times. So "cute" would be your forbidden word. When someone says the forbidden word, they must give up a necklace to whoever catches them saying it. I have seen this game played with other things than Mardi Gras beads, although I do think that they are easy and inexpensive to come by, while being fun. Other things I have seen used for this game are clothespins or stickers. You also don't have to limit yourself to one word. You can also uses phrases or several words. During the holidays if you are playing this as one of your adult Christmas games, you might make Christmas, shopping, decorations...those sorts of words taboo. And of course if it is a birthday...you know what word to leave out! This fun game works for large or small crowds - wherever there are enough people to mix and mingle. One of our site visitors, Pauline from London, UK, wrote in: "for our mostly adult 3 year old's party - since her favourite word was 'No' we had a hilarious, very popular No Off Limits game..."
Here are some that have been shared by visitors like you! When some visitors come to this page, they are thinking of a party game that also has words that you can't say. They are usually thinking of the games Taboo and Catch Phrase. These are great games which I think everyone should own! More about these games and more fun party games to own. Do you have a great party game? Share it!